Hello. You've came to my lovely spot on the internet. So, welcome to A Whole Lot of Hoop Love or Hoop Love for short (I understand that's a mouthful). My name is Shannon. I started this blog to have an outlet in my hooping journey. I've heard that I'm a bit obsessive about it and it was annoying people with all my talk about it. I figured I'd start a blog and it seems to be working out very well. Through my blog and reading others, I feel like I've started to have close friendships with other hoopers on the internet. I started hooping in late January-February. I guess I started because I wanted to use it to lose weight. Except I gave up on that when I started. I've been wanting to learn how to hoop for eons. At least five years. I had three hoops before I started this last journey. I never could find the right hoop at those times and I guess I never figured I should google hula hooping for adults. I don't even know why I did when I started this journey in 2011. I was obsessively checking out the hooping tribes, hooping.org and later, hoopcity. I had three more hoops in February before I could ever waist hoop. I was dreaming about hooping at this point. I was crying myself to sleep thinking there was something wrong with my body. The only reason why I didn't give up is because I had a dream that I should turn with the hoop as I spun. Now, that I think of it, I was even hooping to my current dominant direction. That's amazing cause I was switching my directions in effort to find that "easy side." After I woke up, I tried what my dream showed. It held up for 4 seconds instead of 3. That extra second saved my hoop practice. I figured out that I could hoop when I took Josie's class at the YMCA. I was able to use her big yellow hoop. I was doing the proper motion all this time but my hoop was large enough. I even did my first corkscrew up in that class! I was so happy. I started with a 1 inch, 160 psi 44"-46" duct tape hoop (my flamer). 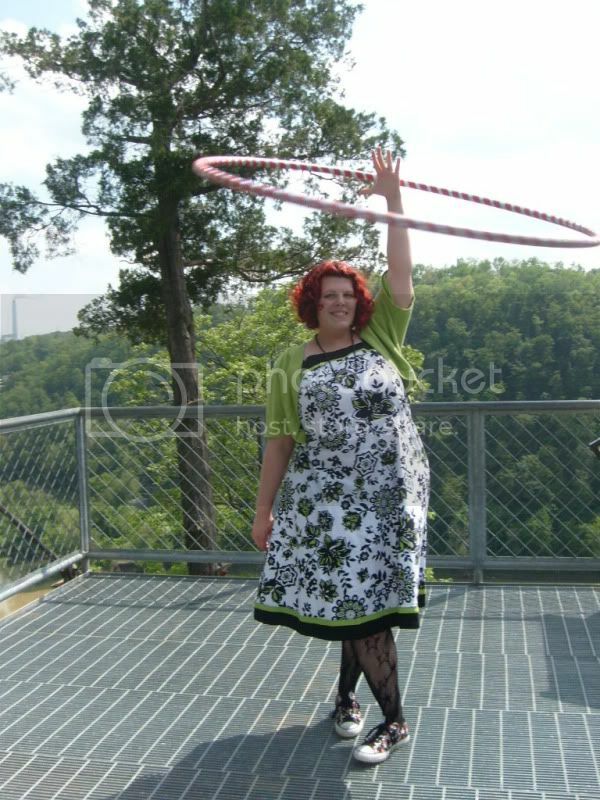 I would use my smaller hoops (hoopnotica, Karmic Circles hoop) to do offbody. When I was being very daring, I'd even do offbody with my flammer. Even with my huge and heavy hoop, it was still hard. I still remember pushing my body to the brink to waist hoop for fifteen seconds. Once I broke the one minute barrier, I was able to hold the hoop up with ease after that. I continued to time my "hold the hoop up without dropping it" personal contests until I reached the sixteen minute mark. When that moment flashed on my watch, I knew I had conquered waist hooping. I stopped timing my waist hooping after that. I didn't need to show myself with numbers that I could do it. I knew. I could feel it in my body. Sometimes I felt bad that I had such a big hoop. Lucky for me that Lara Eastburn was having a "any question about hoop size" blog post. I asked her if I was doomed to use my flammer forever. She said no and explained how she started with a 1 1/2 inch hoop! I continued to push with my flammer cause Lara's amazing. If she can do it, I can, too! I miss my flammer some days when I just want to chill. I made an awesome (horrendous) hoop to take to work. I'd practice with that smaller but still 1 inch hoop a lot. I even bought a troo hoop and taped with all gaffer. I was so proud when I was able to use my troo hoop. 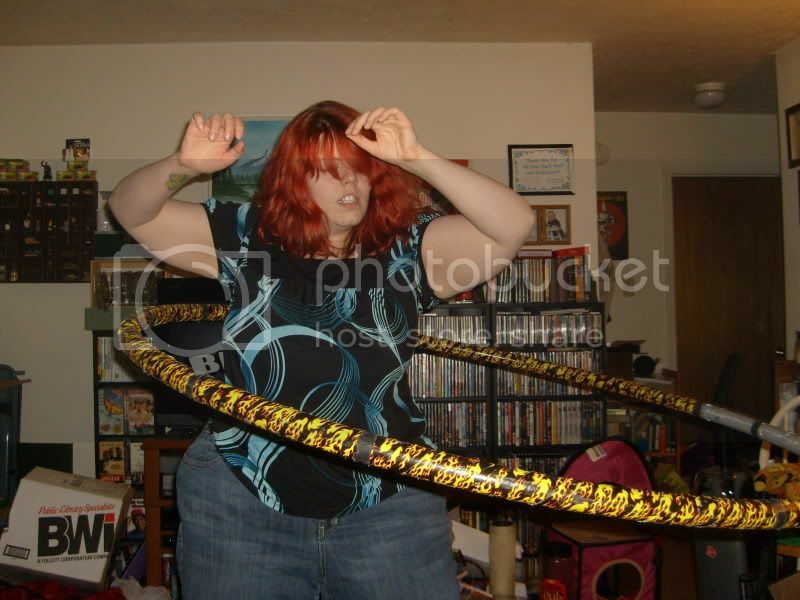 It was still difficult which meant I really didn't use my troo hoop unless I knew I was doing tons of off-body. I didn't downgrade my hoop till May. Basically, whenever I used a reception hoop and fell in love. It was larger than my troo hoop which meant it was easier. I think it's about 44" but it was glittery. Who doesn't love some glitter? I've had an tumultuous beginning. There wasn't much of a hooping community in my area. I felt alone and no one else understood this hooping thing. Although I found out later that there was a small one. I just didn't know about it. I started forcing all my friends to hoop. I started this blog. I've cried about hooping, I've dreamed about hooping and think about it all the time. Well, I didn't win. Which is unfortunate. Winning that contest would have been amazing. And I might have cried when I didn't win. I really need to find someone to support my flow toy habit. At the same time as the Hoop Camp Contest, there was hooping.org's contest for 30/30. 30/30 was a challenge to hoop for 30 minutes everyday for 30 days. I started that knowing how to waist hoop and hip hoop (barely). 30/30 also caused many tears for me. Yet I still finished with flying colors. My hooping improved dramatically. I probably found my personal flow or the beginnings. I can't remember what I finished with knowing past then. I do know that a week after 30/30 ended, I was able to chest hoop. I wish I had a calender where I wrote down every trick learned and conquered. Wouldn't that be a nice bitty scrapbook? After that, I was able to start more regular hoop classes with Josie. She'd have two classes a month. After a while, she'd tell me I had flow, keeping with the music and my improvement was amazing. Yet I just didn't feel like it at all. I felt like a half-failure. I kept trucking. This was something I wanted with all my heart. I wanted to be a hooper. I still didn't feel like a hooper. I continued my growth and ran off to go to Caroleeena's class in Ohio. That class was unbelievable. After I walked out of that class, I felt like a hooper. I don't know why but something about that energy and what I learned did something to my spirit. And she's freaking amazing, just so you know. Again, Josie would tell me she'd run out of stuff to teach me one of these days cause I was learning so much. I still pushed it aside. Somethings I knew and somethings I loved. Somethings with the hoop weren't perfect. My last class with Josie she said my isolations were perfect if I'd stop hesitating. Can you imagine how many things we could do if we don't hesitate? Now, I've started a small facebook group for the Bluegrass area. I found out in that last class of Josie's that there was other people who had classes. Then, I found out through past facebook feeds that there were hoop jams! No one ever told me. How was I supposed to know? That is why I founded the Bluegrass Hoopers. I just want everyone to stay connected. I don't want anyone else to feel the sadness and grief that I felt when I found out I missed a huge hoop jam. It's not to further push this blog but to connect the Bluegrass area in the hoop. Now, I guess my hoop story ends here. I think I may be beginning intermediate hooper at this point. There are still weaknesses in my hooping but that will improve one day. Hooping has gave me confidence and happiness. I've never had the level of confidence that I have now due to hooping. Even when I lost eighty pounds, I didn't feel this good. I've met people through the hoop that I would have never met otherwise and I love them. Hooping is also my gateway drug to other flow arts.